repurchase another tube of the good stuff and what do you find?...one the unholiest of words in beauty...DISCONTINUED!! How will you ever again find a love as true as the one you have for your fave shade? Well don't get ready for goodbye just yet, there's still some (maybe more than you think) left to love. Here's how I got every last bit of two of my favorite Kat Von D shades that were discontinued. RIP Stiletto & Rosary. If you don't have a Palette & Spatula use a paper towel and a popsicle stick. Before lighting the flame, spray the inside of the empty lipstick bead organizer with the alcohol and also the lipstick itself to get rid of bacteria, let it dry and repeat once more. There are two ways to get all out of your tube. First pop the lipsticks you wish to de-pot into the fridge for about 15-20 minutes to harden. 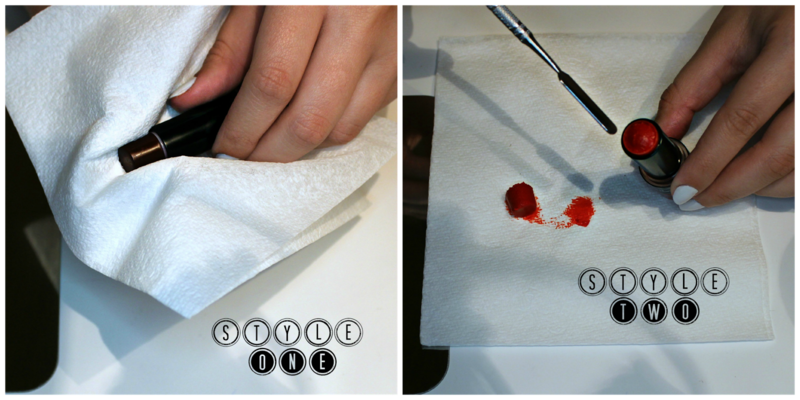 Style 1: You will simply take a clean paper towel and gently (but firmly) squeeze the sides of the lipstick and pull out. You may need to wiggle it a little but if the formula has hardened enough it should slide right out. Style 2: You can first cut off the top of the lipstick and then scoop the rest out. (This is where having a makeup mixing spatula comes in handy as it fits inside the small tube easily. You can find sets of the palette and spatula on Amazon here. Look at how much more was in the bullet! That's a lot of often wasted product. If you're a MAC girl and you have your eye on a shade and want to do a Back To MAC return this is a good way to be able to return the 6 empty plastic packaging for a free shade. Sorry this picture was out of focus...it's hard taking pictures while melting lipstick over a flame. Please do be careful during this portion of the process! Flames and all that jazz. Simply move the lipstick around over the flame and it will begin to melt. If you see the lipstick starting to bubble or steam, pull it off the heat and keep stirring. The product will be exactly as it was as long as you don't over heat it. Once all has completely melted pour into your small bead organizer. You can find these at the craft store or on Amazon here. There was so much left in the tube that I had to do the other half and then pour it on top, because it all wouldn't fit in the spoon. When I was all done I used my label maker so that I could see what shade was inside. I got this Real Techniques Lip Brush for $5.99 and it is perfect because it has a lid so you can chuck both of these in your purse without having to worry about lipstick getting all over the place. When you've used up all of your de-potted product simply wipe out and sanitize for the next lip color. try this or if you have before in the comments. Also, what's your favorite beauty product that has been discontinued? Know that I share that makeup loving pain. If you like these sorts of posts and want to see more please follow my blog here or on Bloglovin'. I am also on Twitter, Instagram & Tumblr so if you're into that follow me there too and we can chat more.